Kona Brewing Company, Hawaii’s largest and favorite craft brewery, knows a thing or two about helping their fans hit pause and enjoy life in the moment with their exceptional lineup of innovative small-batch beers. 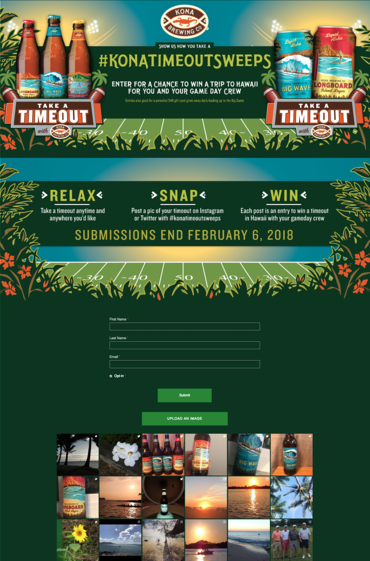 With the launch of their "Take a Timeout Sweepstakes" Kona is hoping to motivate football fans to hit pause on their game day anxiety and experience a refreshingly un-stressful cold Kona beer. One scroll through my Facebook newsfeed after the Patriots made the Super Bowl again tipped me off that emotions were running high and stress levels were at a peak, and more than a few people could use a Kona beer to take off the edge. Kona’s campaign will be running throughout the month of January and the days leading up to the big game. To participate, Kona fans can post a photo showing how they take a timeout with their favorite Kona beer on Twitter or Instagram using the hashtag #KonaTimeoutSweeps or upload a photo directly on their sweepstakes landing page using their Photo Lab powered by Wyng. To encourage participation, Kona is giving away a free trip to Hawaii, as well as daily gift cards to fans. Kona’s DCI score and high engagement is a clear indication that while fans may be taking a second to hit pause on everything else, they are hitting go on participating in Kona’s savvy and timely campaign. Kona Brewing’s DCI score is a combination of an Engagement Score (ES) of 251 and Virality Score (VS) of 66. The “Take a Timeout” sweepstakes made great use of user generated content and timely catch to encourage sharing and engagement. Check out more details below on best practices you can incorporate into your digital campaigns to increase Engagement and Virality Scores. When it doubt, channel Oprah. Kona went big for their “Take a Timeout” sweepstakes and offered their fans an Oprah worthy getaway. Offering a large prize is great way to get consumers excited and participating. Take advantage of improved technology. The updated Wyng Photo Lab component streamlines the photo submission process for consumers, facilitating more time spent on site through an improved overall campaign experience. It also makes it easier for brands, like Kona, to easily execute and bring user generated content into their marketing activities. Keep your campaign timely. The Super Bowl is arguably the premier sporting event in the U.S., so what better time to launch a football themed contest. Consumers are more likely to engage with a campaign that aligns with their current conversations and interests. Tapping into the activity already taking place online amongst football fans was a savvy choice by Kona. Don’t forget Instagram. Kona made the great choice to include a call-out for posting content to Instagram. While Instagram has many safeguards in place around automatic photo and video sharing, brands and agencies shouldn’t be scared off from including the platform in your campaign plan. There are always workarounds! Collect submissions using a hashtag. By collecting submissions across Instagram and Twitter using only a hashtag, Kona lowered the bar for entry, encouraging more consumers to share their submissions. Kona expanded the potential reach of their campaign by also including the option to upload photos directly for fans that may not be the most active on social media. Giving fans multiple options to participate ensured that Kona would cover the most ground and receive participation from all-types of consumers. The Kona Brewing team optimized their campaign to take advantage of new technologies and their fans current actions online by enabling people to simply add a hashtag to enter their sweepstakes. So, if you haven’t yet, head over to Kona’s campaign website and submit your own photo, because seriously, who doesn’t want to win a free trip to Hawaii!